The national holiday to celebrate farmers and fisherfolks in Ghana is less than 24 hours away. But farmers and fishermen feel patronised, General Secretary of the General Agricultural Workers’ Union has said. Painting his picture of patronised farmers, Mr. Edward Kareweh said farmers will be lined up Friday, December 7, and presented awards. But what these farmers will largely be thinking about is how to find a market for their produce, he said. The farmers are not happy to produce Ghana’s foodstuff, they are fulfilled when they sell. The foods are perishable and so to sell quickly, they sell cheaply – as cheaply as some of the prizes they win on Farmers’ day. Joy Daddy Bitters, bicycles and wellington boots for gruesome work of studying the weather, studying the soil, studying the market and sinking seeds into optimum earth. That’s why 2017 Overall Best Farmer for the Prestea-Huni Valley District of the Western Region returned all his prizes after posing for the cameras. The 35-year old John Enimil who owns 120 acres of rubber plantation and 52 acres of cocoa farm plus 10 acres of palm nut plantation, was given five wellington boots, a bicycle, nine cutlasses and – wait for it – two radio sets. He walked away from them. “We need a comprehensive review of the way we celebrate farmers,” the GAWU General Secretary said on Joy News channel the AM Show Thursday. “It is only in Agriculture that it is very difficult to determine the market in advance and that is a major concern,” he said. Mr. Edward Kareweh complained, importation of food and livestock is killing and has killed local agric businesses. Ghana imports $500m worth of meat and $1bn in rice. Addressing some of these concerns, however, government is in year two of its agricultural program – Planting for Food and Jobs. The Food and Agriculture Minister, Dr. Owusu Afriyie Akoto, has spared no little chance to wax proud about the initiative’s successes. Not a single grain of maize in 2018, he has been drawing attention to the feat. Now government wants to launch the livestock version of the program which together will cut down imports of grain and protein. The major concern about prices, has received some attention with the establishment of the Ghana Commodity Exchange. It is much like the Ghana Stocks Exchange – only that the stock here is food. GCX brings smallholder farmers and other actors in the commodities value chain together to buy and sell at more reliable and stable prices. Over there, farmers, traders, food processors and various service providers, including banks and other financial institutions meet to buy and sell. It is the first of its kind in West Africa and one of only three African countries to have this exchange, President Nana Akufo-Addo said, at the inauguration of the Exchange in November 2018. Sensitising farmers of the existence and operations of GCX presents a new challenge to government. The 34th edition of the national holiday event comes off at Tamale in the Northern region with the celebrations decentralised to the districts. The celebration is themed “Agriculture, Moving Ghana beyond aid”. The Day observed on the first Friday of December, began in 1985 after Ghana’s agricultural sector recorded impressive growth after the droughts of 1982 and 1983. The first Farmers’ Day was celebrated in Osino, located in the Eastern Region of Ghana, where the drought was most severe. The first-ever best farmer won for his prize, two machetes, a pair of Wellington boots and a preset radio. Since 2002, the National Best Farmer is given a three-bedroom house. 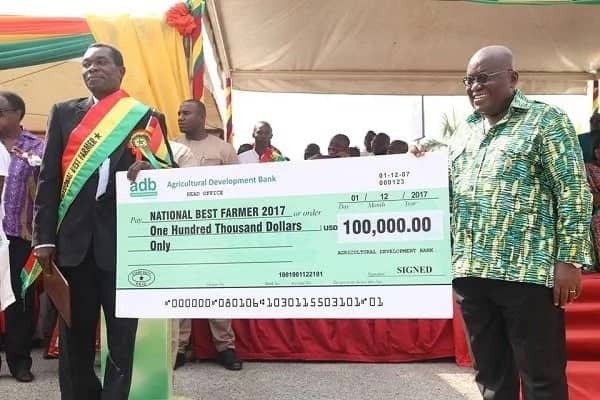 But for the first time in 2017, Brong Ahafo Region-based farmer, Philip Kweku Agyeman, adjudged, the Best Farmer took home $100,000. The Food and Agriculture Minister, Dr. Owusu Afriyie Akoto has however complained about funding for the program in 2018. Government has allocated 2million cedis for the nationwide event – same allocation for 2016 and 2017. The rest of the funding usually comes from sponsorship and donations from corporate Ghana. But it appears, the sponsors may be just as tired of funding and the farmers are tired of the patronising.